If you are in the market for a new blender, you may be overwhelmed by the huge amount of information available on this subject. For instance, if you do a quick search for the term “blenders” on Amazon, you’ll soon be sifting through more than 3,000 results. Even if you narrow your search down to just “countertop blenders,” you’ll still have more than 2,000 options to evaluate. It doesn’t end there, however. Even though Amazon is huge, it is not the only game in town. There are countless other online and brick-and-mortar retailers out there who are also vying for your attention. With so many choices available, how can you possibly decide which blender is right for you? 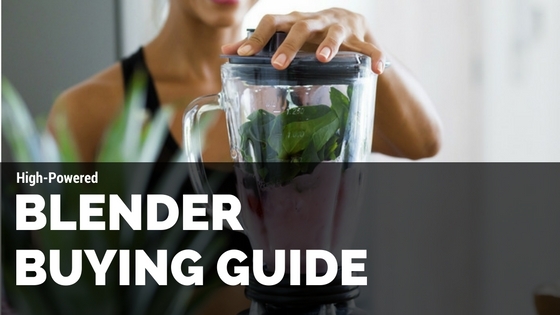 The purpose of this guide is to help simplify the process of buying a high-powered blender. Your time is valuable, so the goal is to help you pinpoint which features matter most to you as soon as possible. Once you have a clear picture of exactly what you want and need, you can narrow your search down quite a bit before you start conducting more in-depth research on specific models. What is a “High-Powered Blender,” exactly? Will I mostly make individual servings or larger recipes? How often will I use this blender? Will I mind replacing an inexpensive blender in a year or so? Am I willing to spend more money upfront to get a quality product that will last a long time? Do I want pre-programmed cycles, manual settings I can control – or a combination of both? Do I only want to blend drinks or do I want to be able to make hot soups, nut butters, bread dough, and other recipes? Am I loyal to a particular brand? If so, would I consider any other options? Do I want to make my purchase online or off? By using this handy filtering system, you can easily narrow a large category like “Countertop Blenders” down from a couple thousand choices to just a few options. To find the best high-powered blender options available, select these options: Amazon Prime (Optional) Blender Motor Power: 1,000 watts & above (leave this unchecked if too few results are returned. Not every model with this much power is marked accordingly). Average Customer Review: 4+ Price (enter in your budget) If you need to narrow your results down further, select the blender capacity that best suits your needs. For example, if you want to make medium-to-large sized batches, select the 60-69 oz. option. If you don’t get enough results, go back and widen some of your search criteria by eliminating Amazon Prime, expanding your budget one bracket up or down, or adding more capacity options. After you’ve refined your search and find several attractive options that fit your needs, you can then conduct more in-depth research on those models before you decide which one to purchase.